The effects Goods and Services Tax (GST) is starting to show with companies slashing the prices of their products to pass on the benefits to customers. 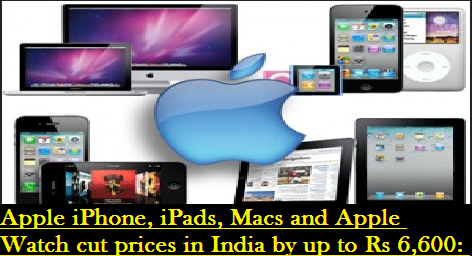 While automakers like Maruti, Toyota and BMW have brought down the car prices by several thousand to lakh, tech giant Apple has also reduced the retail prices of iPhones, iPads, Macs and Apple Watch models for its consumers in India. The US-based company has cut the prices of its iPhone models between 4 and 7.5 per cent. The Rs 60,000 Apple iPhone 7 (32GB variant) can now be purchased at Rs 56,200. The Rs 70,000 iPhone 7 (128GB) is now available for Rs 65,200 and the Rs 80,000 256GB variant at Rs 74,400. The base model (32GB) of Apple iPhone 7 Plus is now available at Rs 67,300 as opposed to Rs 72,000 previously. The 32GB model of iPhone SE (Rs 27,200), being assembled in Bengaluru, will now cost Rs 26,000. The 32GB iPhone 6s (Rs 50,000) is now available at Rs 46,900. The highest price cut has come for the iPhone 7 Plus (256 GB) model which will now cost Rs 85,400 instead of Rs 92,000.